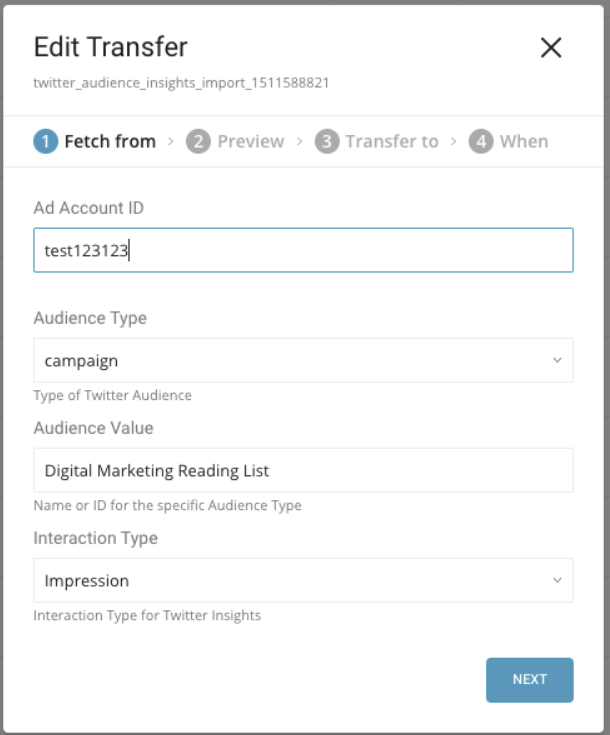 Twitter Audience Insights enables you to collect quantitative data on Twitter audiences. 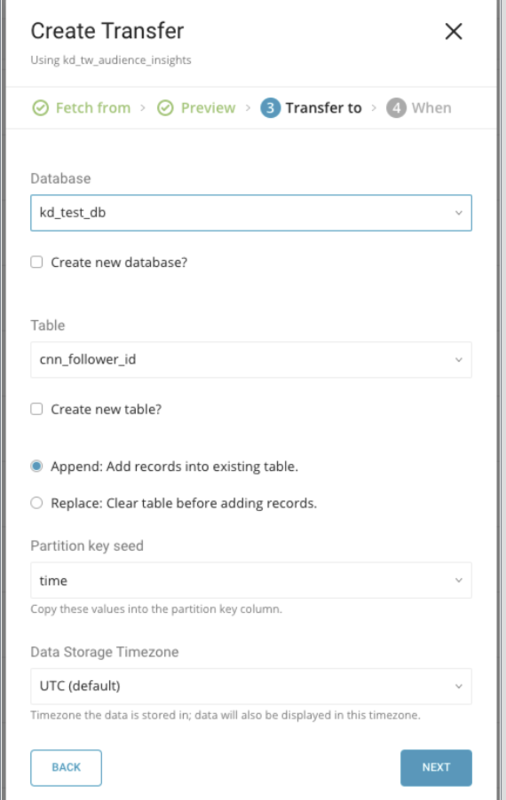 You can import your insight data into Arm Treasure Data for integration with your other data resources on the Treasure Data platform. Basic knowledge of Treasure Data, including the Treasure Data Toolbelt. A Twitter Ads Account or an account with Ads Manager role. Go to Treasure Data Connections. 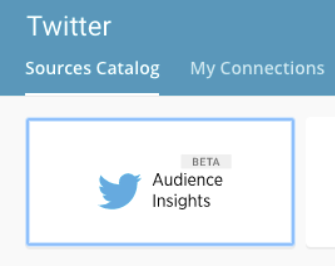 Locate and select Twitter Audience Insights. 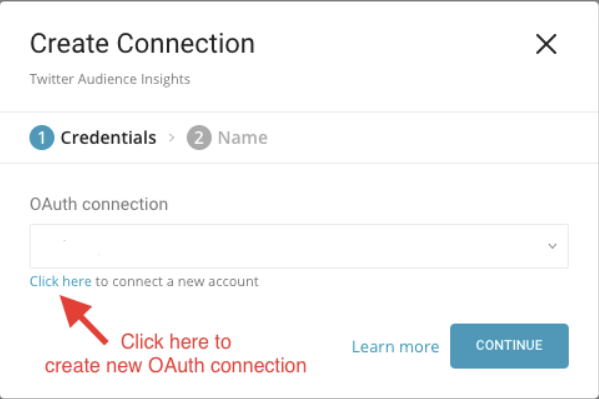 Select an existing OAuth connection for Twitter, or click the link under OAuth connection to create a new connection. 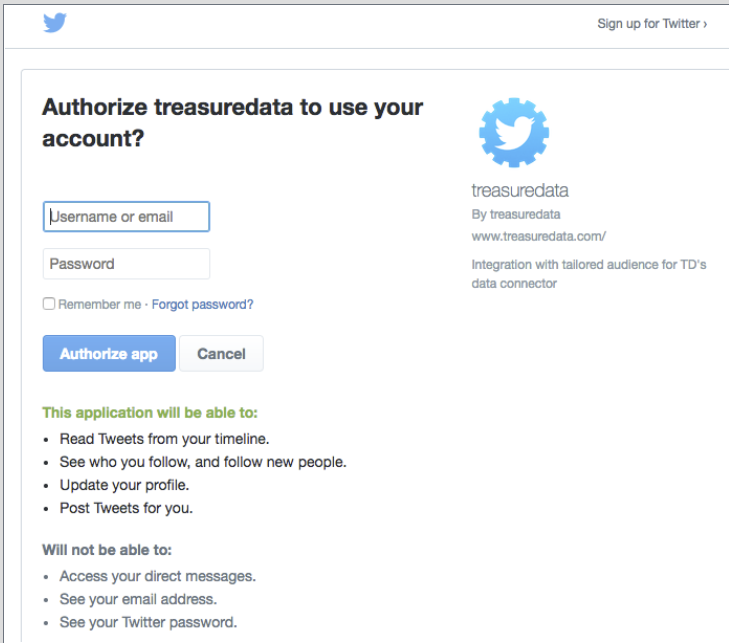 Grant access to the Treasure Data app. Next, go back to Treasure Data Connections. 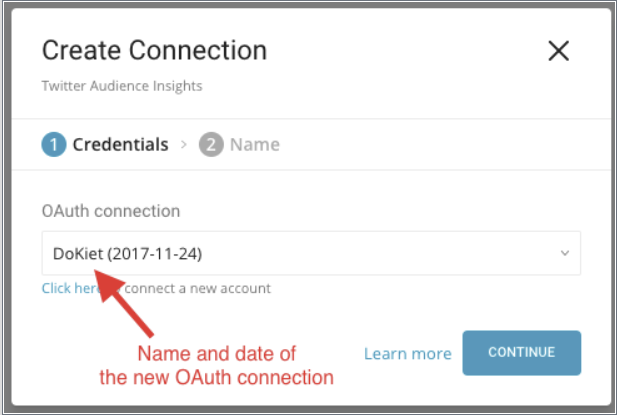 Repeat the first step (Create a new connection) and choose your new OAuth connection. Provide a name for your newly created connection and Save. 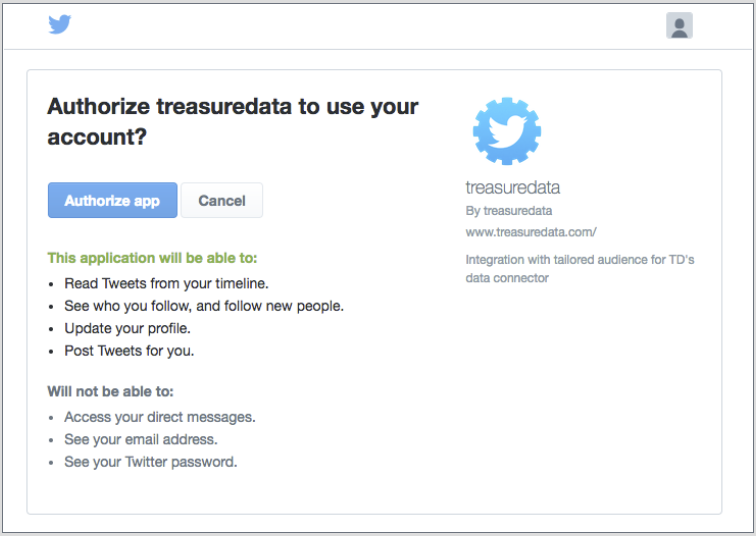 Step 2: Configure to start transfer of data from Twitter Audience Insights to Treasure Data. 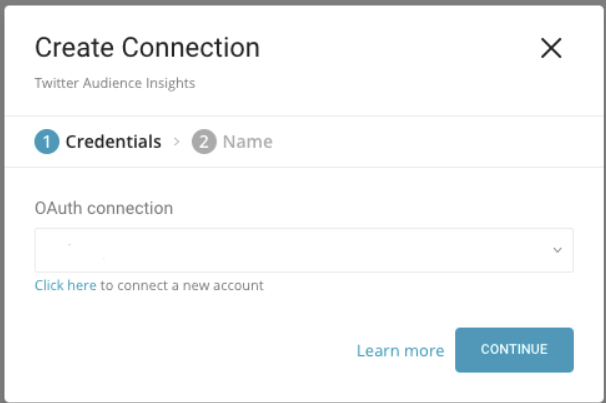 In the My Connections tab, look for the connection you created. 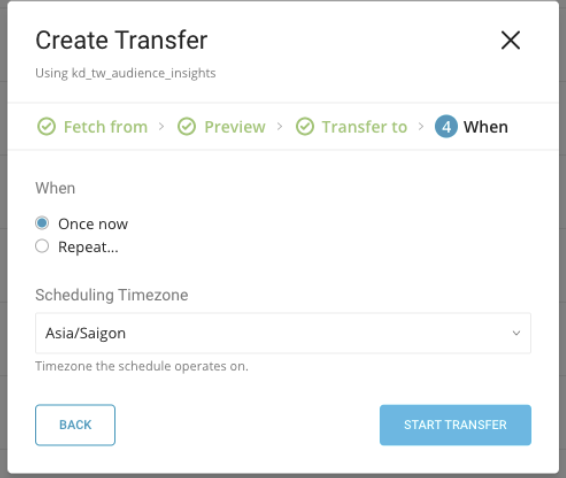 Select the connector and click New Transfer to start a transfer. 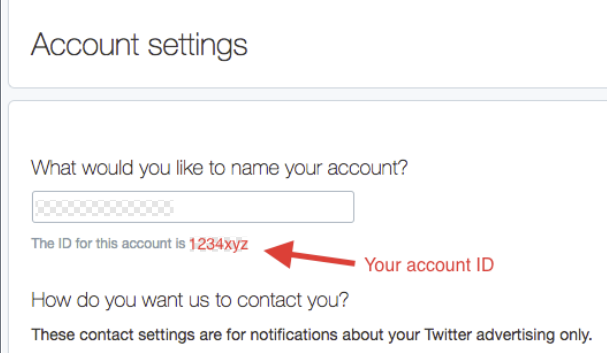 Ad Account ID (required): This is your Twitter Ads Account ID. See Appendix A for information about retrieving an account id. 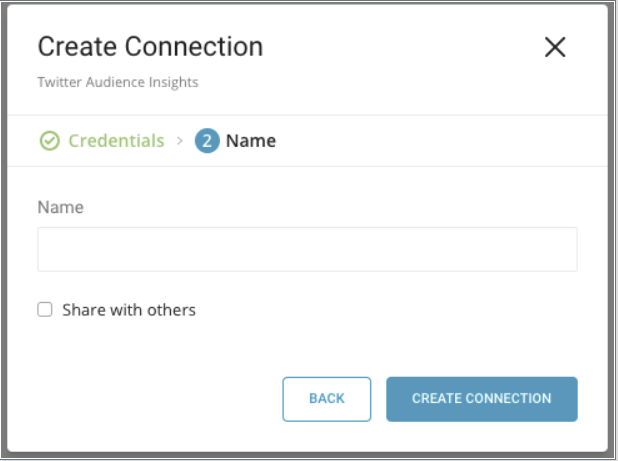 Audience Type (required): Name of Audience Type that you are retrieving data from. Audience Values : The ID or name of the specific audience group/sub-set. 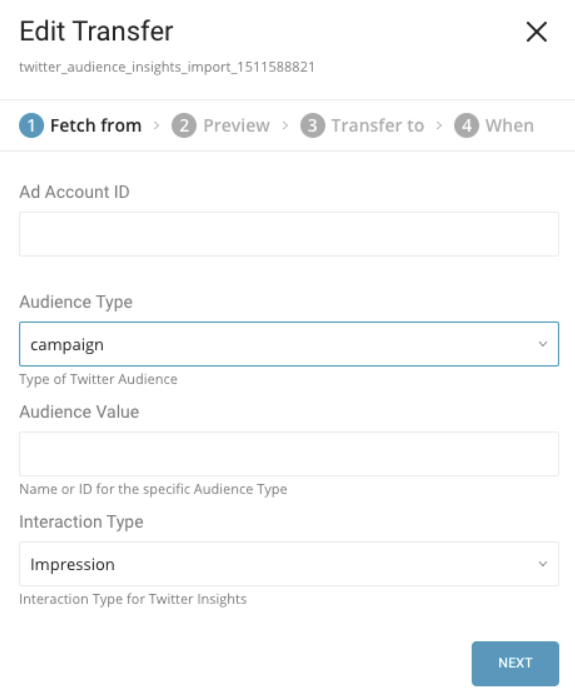 For example, when Audience Type is Twitter Ads Campaign, the value is individual campaign's name or ID. The data contains several columns for the desired Audience Insights. Appendix B provides a brief description of what they are. If the preview data is acceptable, go to the Next. If you want to make changes to the import details. click Advanced Settings. Advanced Settings contains some options to control the retrying mechanism for getting data from Twitter API. These values are best kept at their default values and tuned only when there is issue with network connections. Retry Limit (optional, default 3): Number of retries before before the connector stops trying to connect. Retry Initial wait in Milliseconds (optional, default 10000): Interval to retry if a recoverable error occurs (in millisecond). Retry Max wait in Milliseconds (optional, default to 300000) : Maximum time in milliseconds between retrying attempts. You will see the new data transfer in progress listed under the My Input Transfers tab and a corresponding job will be listed in the Jobs section. or from your Ads Insights URL.